Anyone reading this use Ravelry? I’m Lysh on Rav, look me up. Hmm…after looking at my profile, I can see I have a lot of updating of projects and adding of stash to do. Naughty Lysh! That was very kind of you to join my link-a-long thank you. I was a bit disappointed that I did not get much of a response to my linky. Maybe they just need to get to know my blog a bit better. I wanted to make it different then My Creative Space on Thursday at Kootoyoo. Do you think it is too similar? Anyway I am soooo glad it is the weekend. I have study, I am making cakes and I have crafting to do this weekend that should keep me busy enough. 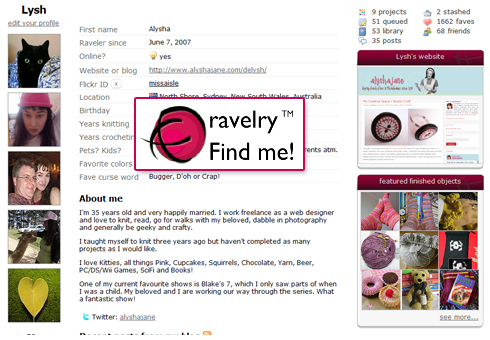 My sister is on Ravelry I will probably have a look and join too. Have a good weekend.